The newer works, shifting away form the cylindrical forms, but still adhering to a strict material diet, act as objects from these landscapes. Some act as tomes, containing foreign information; others as stand-ins for familiar domestic objects but with fundamental idiosyncrasies. As sparse and concise as these pieces are, this work is replete with inherent feuds. Ruiz somehow manages to investigate and celebrate both fictional landscapes and material honesty. It is elegantly abstract and evocatively representational and, in the way she positions synthetic and natural materials together, she creates a tiny battle over those materials’ permanence in relation to each other. 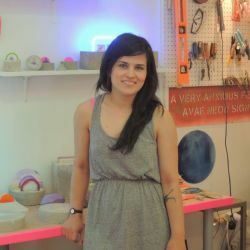 Esther Ruiz received a Bachelor of Arts degree in Sculpture from Rhodes College in 2011. She has shown nationally and internationally at various galleries including The Schneider Museum of Art, HILDE, yours mine & ours gallery, New Release Gallery, Planthouse Gallery, Brooklyn Academy of Music, Platform Baltimore, Vox Populi, Field Projects, Fridman Gallery, Reynolds Gallery, Regina Rex, and The American Center for Physics. In 2015, Spaceworks awarded her the Artist Grant and Williamsburg Studio Lottery. She was born in Houston, Texas, and currently lives and works in Los Angeles, California.